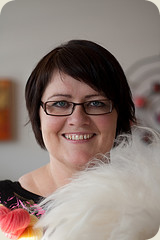 Ragga is an Icelandic knitting expert, designer and entrepreneur. After earning a university degree in nursing and spending 10 years in sales and marketing, she decided it was time to let creativity take over and invest all her time and energy on projects related to knitting. She now owns and operates the well known knittingiceland.is and works full time as an instructor, designer, and knitting tour guide. Ragga's firm belief is that knowledge liberates the knitter. That's why she loves to motivate and enable knitters to think outside the charts and beyond the patterns. Ragga's sound knowledge of the Icelandic knitting heritage and techniques and her laid back teaching style has earned her an international reputation as a fun and informative instructor. Prjóniprjón (Self published, 2008, Icelandic), co-author. Knitting Iceland - Patterns published online in English and Icelandic.